You and your friends and family are invited to hear from Fr. Pius Win Than, Associate Director or Caritas Pathein, a local CAFOD partner based in Myanmar. Caritas Pathein works with poor and vulnerable communities in the Diocese of Pathein, helping communities to mitigate disasters through supporting the development of emergency preparedness plans and increasing their understanding of their basic human rights. There is no charge for the event, but voluntary donations towards Lent Fast Day 2015 are very welcome. If you are interested in attending please sign up by emailing marana@cafod.org.uk or leave a message on 0207 0955417. Alternatively sign up here. Romero House is situated at 55 Westminster Bridge Road, London SE1 7JB, near Lambeth North Tube station and Waterloo Railway Station. Visitors from Myanmar (Burma) come to Our Lady of Sorrows in Effingham on the 17th of February. We are delighted to annouce that we have Fr Pius Win Than from Myanmar (Burma) coming to talk to us on the 17th of February about CAFOD’s work in Myanmar. Fr Pius and the Pathein diocese have already benefitted from the support of CAFOD, but will also be a direct beneficiary of the Lent Fast Day appeal, so a perfect spokesperson. We will also share a stand up buffet. 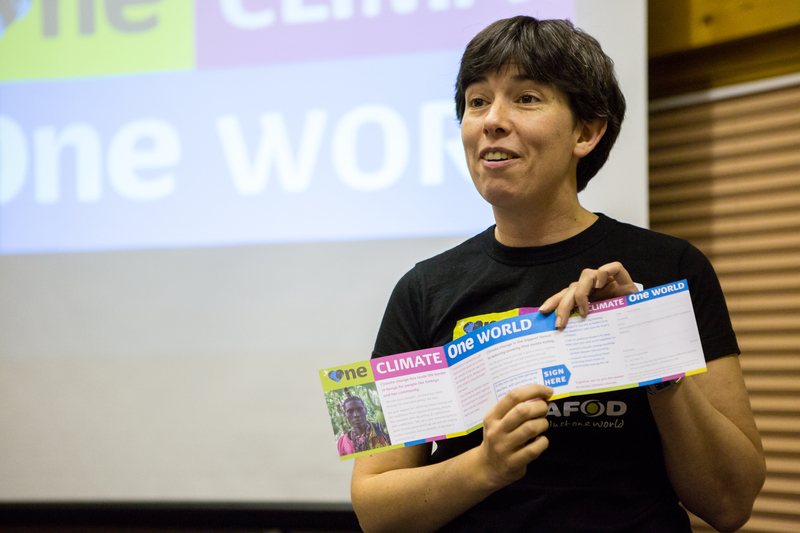 Speakers who can speak of their personal experiences of CAFOD’s support are always inspiring and people who hear them are uplifted – knowing that their donations are being well used. 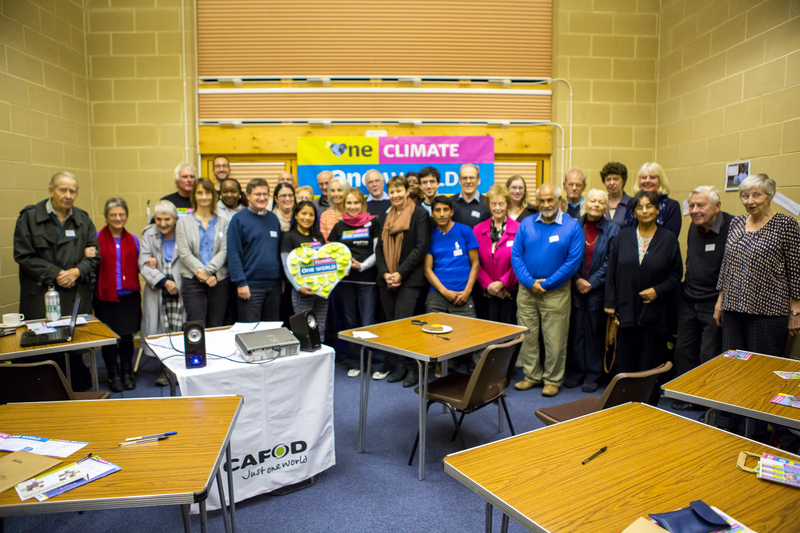 Many also enjoy the gatherings to meet other CAFOD staff, supporters and volunteers. It is well worth coming along. Father Pius Win Than is the Associate Director or Caritas Pathein , a local CAFOD partner based in Myanmar. Fr Win Than has been working in Caritas since 2005, supporting his staff wherever necessary; whether that is travelling to the project areas to meet the communities or putting his staff in contact with the township authorities. Caritas Pathein works with the poor and vulnerable communities in the Diocese of Pathein, helping them to increase their job opportunities and income, increase their access to health care , increase their understanding of their basic human rights, and help communities to mitigate disasters through supporting the development of emergency preparedness plans. There will be Mass in Our Lady’s of Effingham Catholic Church at 6pm if you are able to make it and we will have the talk after Mass in the hall starting at 7pm. Please do get in touch with us with questions or for direction and to let us know you are attending what will be a wonderful evening. 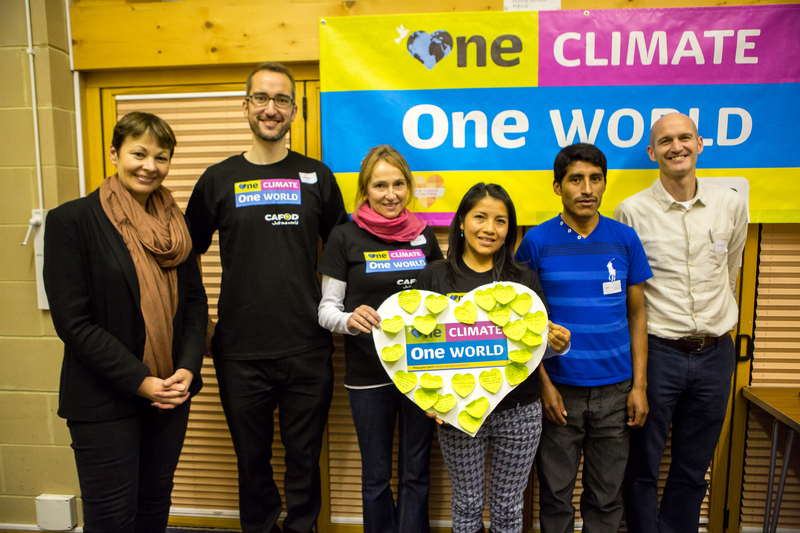 On Tuesday the 21st of October, not November, people came from far and wide to join us for the launch of our new campaign, One Climate One World. On the evening which the country was suffering the remnants of hurricane Gonzalo we still had a full house at St Mary’s Cassidy Centre in Brighton. Members of the Parish team along with Roger and Rosemary Morton helped us ready the room for the evening. Our visitors from Peru arrived after some reportdely delicious fish and chips from the seafront and gave us a good feel for the situation in Peru and the work that our partners C.E.A.S. (Commission Episcopal de Accion Social). C.E.A.S. are the Peruvian Bishops’ Social Action Commission. I (Martin) visited their headquarters in Lima with Louie and Eamonn last year, you can read more about that visit here: ‘I was in prison and you visited me’ and ‘Social Action in every tier of society’ They are an inspiring organisation. 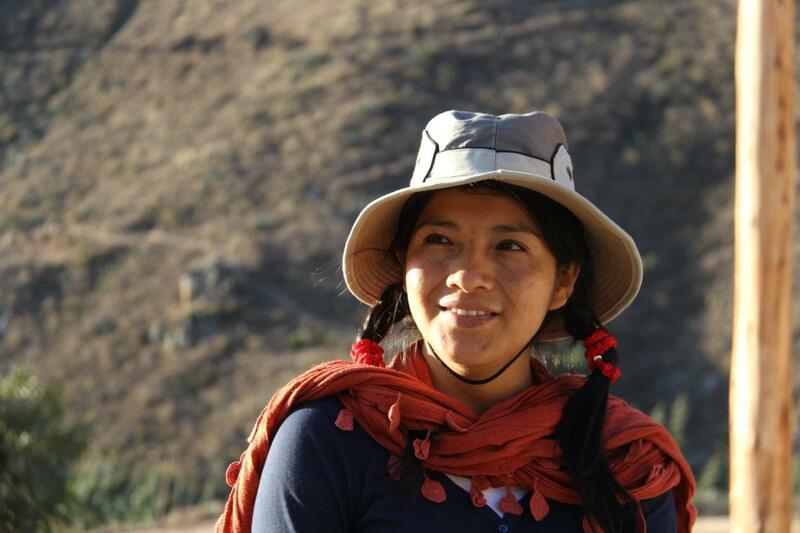 Jesy Romero is a community organiser and coordinates a programme for fair water distribution in Ancash for CEAS. Jesy has also been an accompanier supporting human rights, participation, leadership and advocacy. Jesy is a passionate environmentalist and this came across during the evening as she spoke about glacial melt and her work to ensure people have access to dwindling fresh water supplies. 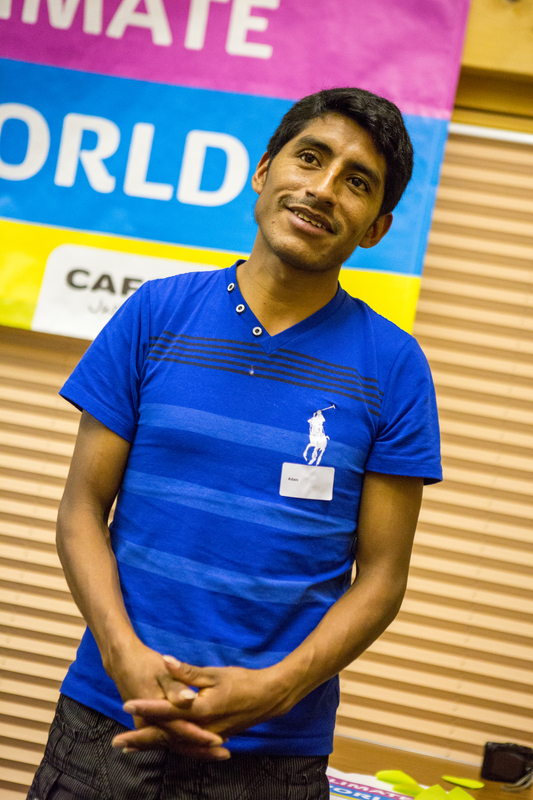 Adan Samuel Pajuelo Bula is both a farmer and community leader from Cruzo de Mayo (Cross of May). They are at risk of losing their access to water which comes from the mountain glaciers. These glaciers are melting causing problems for all those who depend on them for clean water. “My job is to coordinate the provision of water. CEAS has taught us how much water we can take from the lagoon, so as not to waste it. We are trying to let the lagoon reach its original level. There are 2,800 families in Cruz de Mayo. The water also sustains people living in Yungay, Caraz and Campiña. It´s a great responsibility. Water brings us problems, but also unites us. “Some families only have access to water for their crops 1 day every month… When the glaciers melt, we won´t be able to grow corn, carnations or potatoes. This place will become a desert.” Sarah Smith-Pearse, well known in the diocese because of her many trips down here, once again showed her incredible talent at translating and ability to remember some very long strings of sentences. 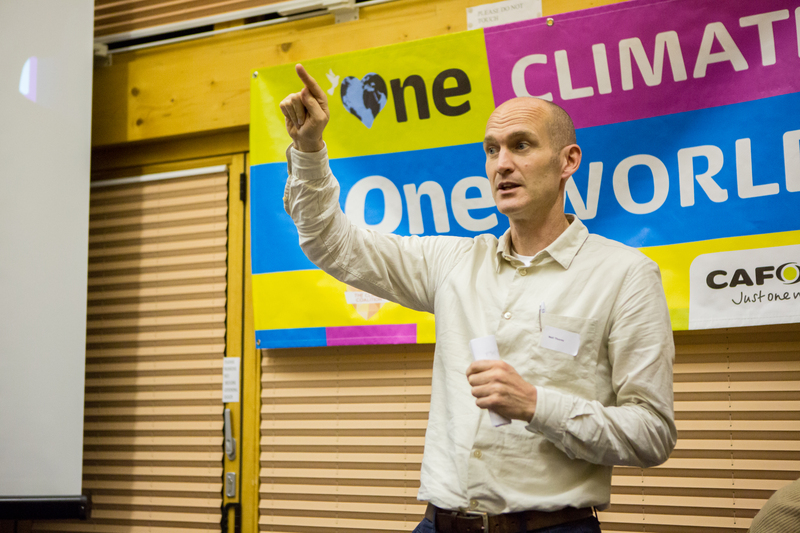 Neil Thorns, CAFOD’s Director of Advocacy and Communications, helped us understand the bigger picture of the global politics of climate change. He assured us all that “The work CAFOD supporters do has a global impact” and explained the links in the chain that leads from our campaigning all the way up to global summits and global change. His wisdom, knowledge and experience was called upon with some excellent questions from the floor. Sarah Hagger-Holt who is heading up this campaign energetically explained the various things that we can do to make the campaign a success. These include actually doing the campaign action (to do this go to our campaigns webpage) and becoming an MP Correspondent. After a brief pause for people to complete their postcards and make pledges on small hearts we all squeezed in tight, smiled and said cheese a few times. Caroline Lucas, local MP joined us at just the right time. Caroline spoke passionately about climate change, about the need for Parliament to divest their pensions from fossil fuels and encouraged us in our campaigning. We would like to express our deepest thanks to all those who made the evening a success; Caroline Lucas MP, Neil Thorns, Sarah Hagger-Holt, Sarah Smith-Pearse, Jesy Romero, Adan Samuel Pajuelo Bula, Roger and Rosemary Morton, the Parish Social Action Group, John for help with the hall and many others. For more information about our campaign please visit our campaign webpage!